A pretty good looking guy is he not? I know that many of the people who I follow read solely YA books and have likely never picked up a Terry Pratchett novel. That's why I need to bring this fabulous author to your attention! So today I give some love to you, Sir Terry Pratchett. Sir Terry Pratchett sold his first story when he was thirteen, which earned him enough money to buy a second-hand typewriter. His first novel, a humorous fantasy entitled The Carpet People, appeared in 1971 from the publisher Colin Smythe. Terry worked for many years as a journalist and press officer, writing in his spare time and publishing a number of novels, including his first Discworld novel, The Color of Magic, in 1983. In 1987 he turned to writing full time, and has not looked back since. To date there are a total of 36 books in the Discworld series, of which four (so far) are written for children. 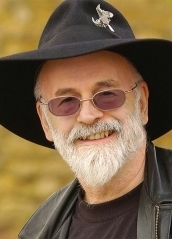 Regarded as one of the most significant contemporary English-language satirists, Pratchett has won numerous literary awards, was named an Officer of the British Empire “for services to literature” in 1998, and has received four honorary doctorates from the Universities of Warwick, Portsmouth, Bath, and Bristol. His acclaimed novels have sold more than 45 million copies (give or take a few) and have been translated into 33 languages. As much as I'd love to feature ALL of Terry's books, that would take a ton of space! So here two of my favorites! As mentioned above, there are 32 books in this series! The Color of Magic is book number one and I was hooked from the moment I opened it! Featuring a crazy magician named Rincewind, the Discworld novels will make you laugh out loud! Rincewind manages to get himself in a whole lot of situations, and there is never a dull moment when he is around! The Wee Free Men is technically part of the Discworld novels, although this one is really geared more towards younger readers. I loved each and every bit of this book! The main character is Tiffany Aching, and she happens to be a witch-in-training. Armed only with a frying pan and her sharp wits, she finds herself thrown into a fray between the Wee Free Men and the Queen of the Elves. It is 375 pages of pure imagination and excitement! “...you’ll still be beaten by people who spent their time working hard and learning things and weren’t so lazy. Goodbye." Thanks for visiting today! I hope I sparked an interest in Terry Pratchett for you! Have you read the book he wrote with Neil Gaimen, Good Omens - it's brilliant! Tech Talk for Book Bloggers! Round 2! How reviewing has made me grow as a reader! Tech Talk for Book Bloggers! An affinity for Neil Gaiman.